Of all the woman warriors in myth and legend, few are more storied than Boudicca, the fierce red-headed queen who led the most celebrated Celtic rebellion in history. But, here, for the first time, Jan Surasky imagines Boudicca’s enthralling story of bravery and triumph from the Celtic perspective. In her extremely researched, vividly told novel, Boudicca bursts to life as never before. After a politically matched marriage to a much older king her world turns dark. Romans invade and at the king’s death attack the palace, breaking a pact that would have saved the tribe from doom, publicly humiliate Boudicca and assault her two young daughters. Betrayed and outraged she leads thousands of warriors into an epic battle to avenge her daughters and rid her beloved island of Roman tyranny. 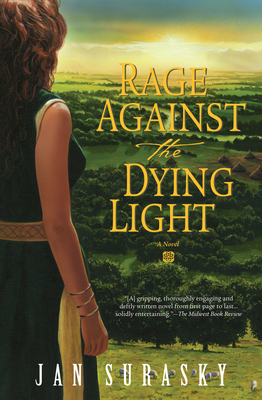 Beautifully written, grand in scope and intimate in detail, Rage Against the Dying Light resonates with the queen’s indomitable spirit placing her alongside no lesser woman warrior than Joan of Arc herself.